Healthcare@: Do you want Ben Carson to sign your book? Ben Carson will be in Richmond this Saturday. We have very few seats left so I'm encouraging you to purchase your tickets right now. And as a special announcement, I remind you to bring your Ben Carson book to the event and Dr. Carson will sign it for you! We also will have a limited quantity available at the event. Please read Victoria's message about this unique event below and purchase your tickets, right now. Speaking 10 feet from Barack Obama, Dr. Ben Carson dared to protect traditional marriage, our religious freedom, and the innocent human beings from state-sponsored abortion through Obamacare. Ben Carson has an important message for real conservatives in Virginia on October 4 and I invite you to hear what he has to say. When asked if he'd run for president, Ben Carson said, "If the Lord grabbed me by the collar and made me do it, I would." Sean Hannity and Rush Limbaugh immediately took notice of Ben Carson. Now Virginians, as a true bellwether state, will take notice. There's no mistake, there is something big happening in Virginia. That's why Ben Carson is featured at our annual gala on October 4 and I personally invite you to attend and hear him. So far, 1,700 conservative pro-family Virginians like you are going to gather with Ben Carson on this historic night in Richmond. 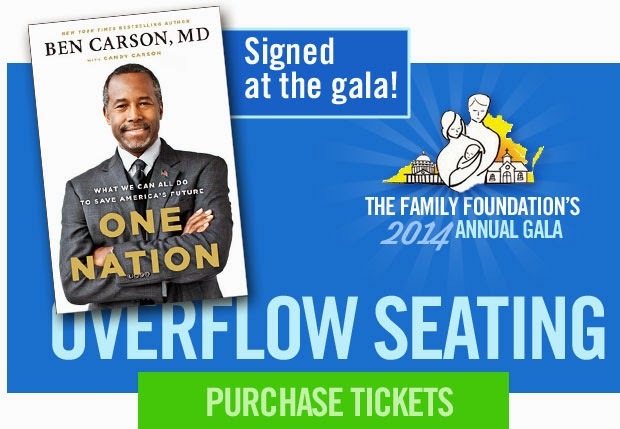 Will you accept my invitation to attend The Family Foundation's annual gala featuring Ben Carson? Will you also bring your family and friends? We are nearly out of tickets and -- as you can imagine -- few tickets remain. That's why I've made arrangements to offer 300 extra seats in a special section for real conservatives to attend this major event. Click and follow this link to secure your tickets to see Ben Carson, right now. In this special section, we will carry a live video feed of Dr. Carson’s speech and the entire Gala! See Ben Carson on the Big Screen! Enjoy the same dinner and entertainment! Have the same opportunity to have a book signed by Dr. Carson! After Dr. Carson’s speech, he will do a book signing of his latest, best-selling book. You will have an opportunity to have your book signed by Dr. Carson (and maybe even a quick photo). Over 1,700 people will be part of this historic evening of Virginia’s largest political gathering of conservatives. Will you be there? Learn more and purchase your ticket today for overflow seating before it’s sold out!